Cobblers are hoping to arrange some behind closed doors games over the coming weeks so fit-again players can build up their match fitness. Matt Crooks, Dean Bowditch, Ash Taylor and Shay Facey have all spent time in the treatment room at some point during the past few months while Junior Morias, who was also injured, and Sam Foley missed several games through suspension. Effort, commitment, desire, application and willingness is all there. We need a little bit more creativity, a bit more confidence and some more belief because we’ve got some good players. Goalkeeper Lewis Ward would also welcome more game-time having only made five appearances this season, and manager Keith Curle is keen to organise one or two friendlies so he can assess his squad in greater detail ahead of the January transfer window. He said: “What we’re trying to do now is organise games behind closed doors in the next few weeks so he can get more game-time and improve his (Ward’s) decision-making because that’s vitally important. 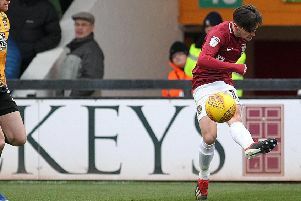 The imminent return of Crooks in particular will be welcomed by Curle, who admits the Cobblers have struggled for creativity in the final third during recent games. “Effort, commitment, desire, application and willingness is all there,” he added. “We need a little bit more creativity, a bit more confidence and some more belief because we’ve got some good players. “We will keep going to try and get something out of the game, whether it takes 95 or 96 minutes or it takes us to penalties and that’s the attitude we want in the players. “They know they’ve got to have emptied the tank when they come off the pitch, physically, mentally and covered as much ground as they can do with purpose and with intent. “Respect the simple things, do them well and then we can turn to page two. Players can be too relaxed and they become sloppy.